This is OurHouse, the best mobile app and web platform ever created for Greek and NPO chapter management. Our team of former Executive Council Officers developed this app to help make the jobs of every Future President, Exec Officer and Member much easier and more efficient. Give all of your officers access to our admin panel to collaborate and manage the house from one platform. Provide your members with one unified place for all of their in-house communication. Take your private info off of public social media and keep your members safe. Call or text anytime at (310) 413 - 3072 or (310) 702 - 8518 or send an email to info@ourhouse.us to create your Chapter Account in minutes! Then you can create your Personal Account through the app or here on the web. Thank you for helping us transform the OurHouse App with all of your amazing feedback! Interested in joining the OurHouse Team? For more information please email info@ourhouse.us today! 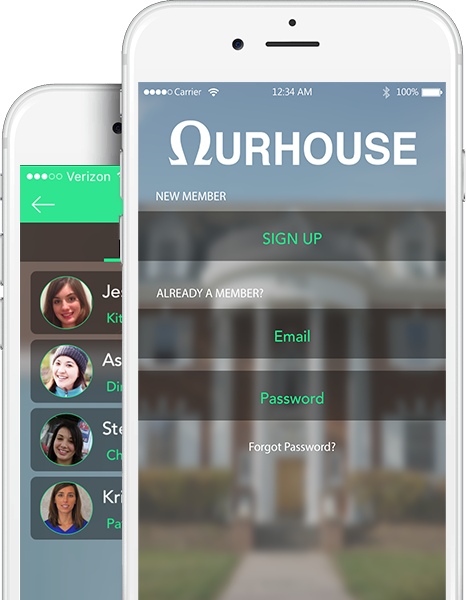 OurHouse will replace chapter Facebook groups and eliminate the time/cost of unnecessary mass texting, emailing and other web services to help change the culture of the Greek system forever. iOS app, Android app, web access for Members, web access for Chapter Admins. Feel free to call or text us anytime (310) 413 - 3072 or (310) 702 - 8518. You can also submit any questions below, please include your school and chapter name!